One thing that I’m very passionate about it traveling. I love being immersed into new places and new cultures. In my opinion, one of the best ways to get to know a culture is to eat the food. When I go somewhere new, finding good food is one of the things I get most excited about, is that weird? Well anyways, this summer I was lucky enough to take a two week trip to Europe, and Amsterdam was the first stop. Amsterdam was interesting because there wasn’t necessarily that many things that were really traditional dutch foods. And unfortunately those few traditional foods I forgot to take pictures of…of course. I’ll go through everything I did manage to photograph and write a little blurb about everything else at the end. If you ever get the chance to go to Amsterdam I highly, highly recommend the The Foodhallen. I had seen this place on a lot of the blogs I looked at when trying to get an idea of where to eat and was so excited to find out our Airbnb was literally a block away. Needless to say we ended up going every single day…whoops. This was like the foodie’s version of a food court and every single thing I tried was delicious. 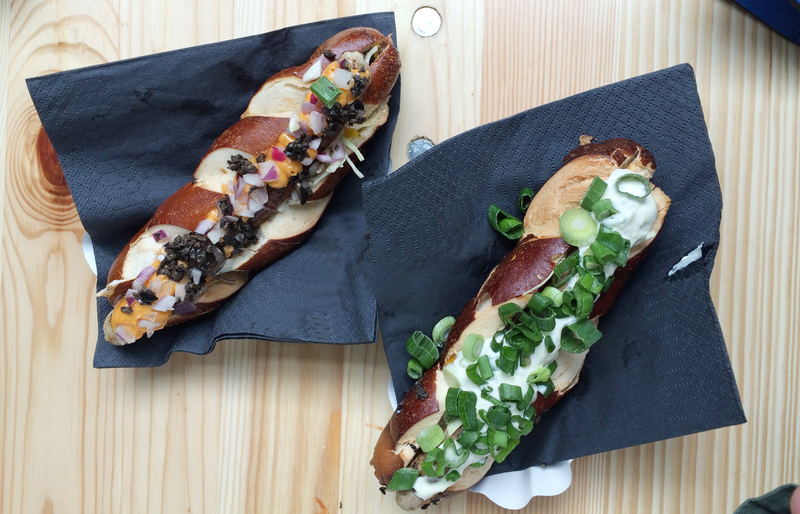 The first thing we tried was the gourmet hot dog stand called Bulls and Dogs. Mine was a greek-style dog with taziki sauce and scallions, Sam’s had pimento cheese, onion, and olives. Both were in pretzel buns and were so amazing. We also tried a little dessert place called Petit gáteau. They had amazing little mini tarts in just about every flavor you could think of. I’m not gonna lie…we definitely went here more than once, but I only photographed one visit. This was a vanilla, a strawberry crumble, a caramel, and an apple crumble and they were all amazing. We also tried a few places that I, unfortunately, didn’t photograph. I think my favorite of these places was a little pizza place called Pink Flamingo. Apparently this place is a chain, but I don’t even care because it was so amazing. You can basically make your own personal pizza by choosing 4 different slices of whichever pizza you wanted. We ended up getting two pieces of Almodovar, which was chicken, chorizo, and shrimp, and the Obama which had bacon and pineapple chutney. We tried to go back another night but sadly they were closed. I also tried a spring roll from a Vietnamese stand and Sam tried a spinach pot pie from a pie stand. The next stop was to a little cafe called Lunchroom Wilhelmina. We just happened to pass this place on our way into the city center on our first morning and I am so glad we did. 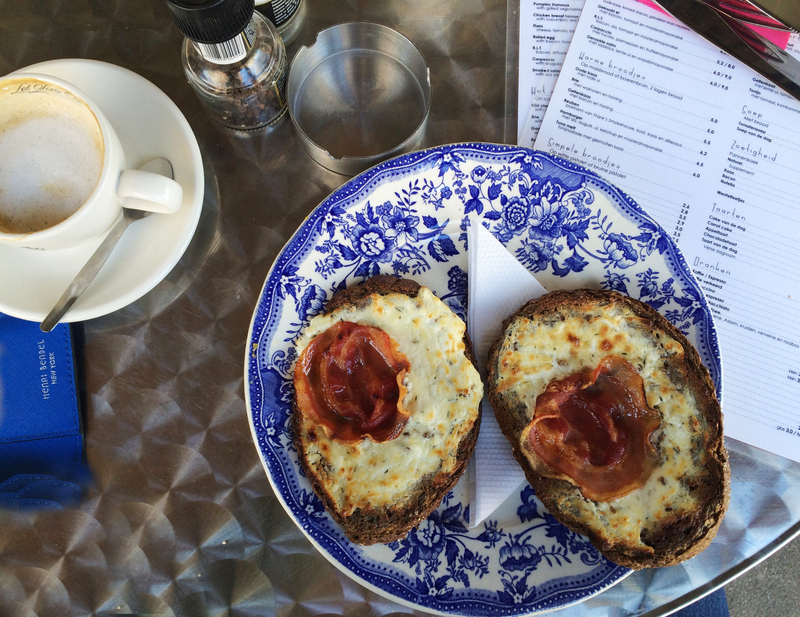 It was a tiny little cafe in an area close to Vondelkerk and an entrance to the Vondelpark. Sam and I both got this incredibly simple, incredibly delicious meal of rye bread with goat cheese, bacon, and honey. We also tried to go back here but when we went back their electricity was out so they couldn’t make anything hot. It was very unfortunate. Looking at this picture is making me really sad….. moving on. This is one place I saw on pretty much every single website I looked at when doing research for the trip. They are said to have the best fries in Amsterdam. 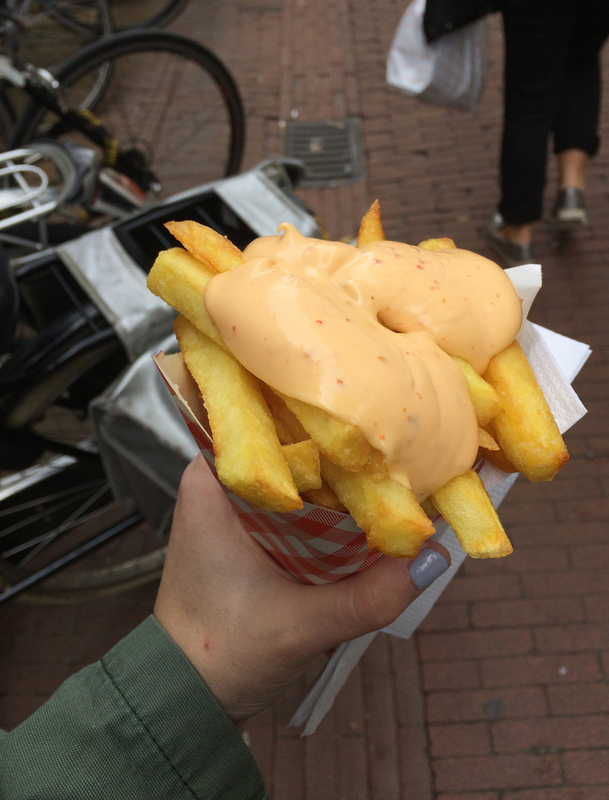 I didn’t actually try any other fries in Amsterdam but these were pretty damn good. I love that they just plop the sauce on top, and they were definitely not shy about the amount of dipping sauce they give. I got samurai sauce, which was basically like a spicy mayo. These were sooo so good, so cheap, and so easy to eat while we were walking around as well. Apparently the lines can get really long but we got lucky and only had to wait behind 3 or 4 people. We ended up being in Amsterdam for Sam’s birthday and he wanted Italian, so we went to De Italiaan. Pizza was a major theme of our trip. We ended up getting pizza in all three stops at least once, so prepare for a lot of pizza pictures over the next few months as I post about the rest of the trip. 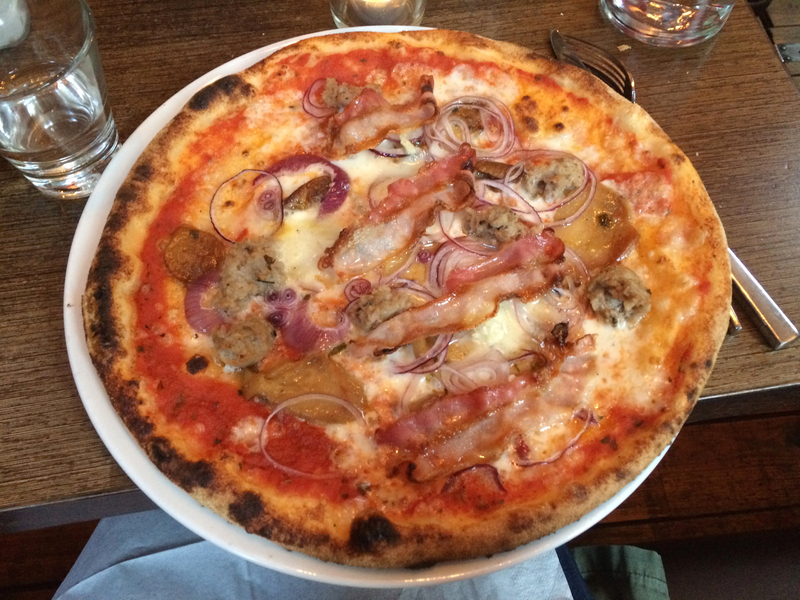 This was a delicious wood oven pizza with pancetta, red onion, and mushrooms. Sam also got some amazing gnocchi with cheese sauce. This was also probably our most expensive meal or the trip, and it wasn’t even that bad. So if you’re looking for fairly budget friendly food in Amsterdam all of the places I’ve mentioned are great. One thing you shouldn’t miss out on while in Amsterdam is the dutch pancakes. We stumbled across this little shop near Dam Square after the original place we wanted to go to was closed. But this place did not disappoint. Sam and I both opted for sweet pancakes, or course. Mine had apple, raisin, and cinnamon with toasted almonds on the inside and a salted caramel sauce on top. It was amazing. 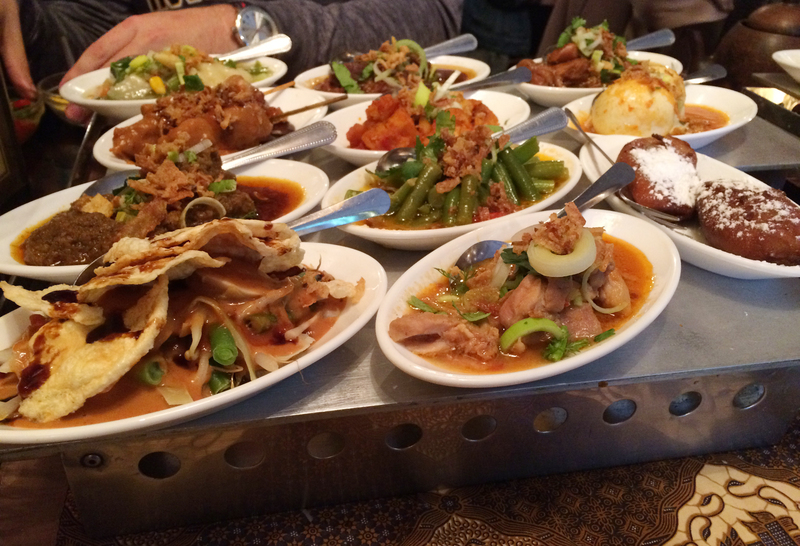 One of the things that I was most excited to try in Amsterdam was Indonesian food. I had read so much about how the Indonesian food there is so amazing and authentic. So from what I’ve read (aka what Google is telling me write now as I type this post), the Dutch used to trade spices with Indonesia. When the Dutch East India Company went bankrupt, Indonesia actually became a colony of the Netherlands, causing the Dutch to embrace Indonesian cuisine. What intrigued me most about Indonesian cuisine is that it wasn’t just new food, it was a whole new experience. They bring you 12 small dishes on a hot plate for two people to share. This was actually one of the cheaper Indonesian restaurants in Amsterdam but it was amazing. It ended up being one of our favorite things we ate throughout the whole trip. We got the Ramayana meal, which is suggested for first-timers. It included chicken satay with peanut sauce, beef in spicy coriander sauce, stewed beef, chicken with spicy Balinese sauce, chicken with ginger and soy sauce, Indonesian salad with peanut sauce, mixed vegetables with coconut milk sauce, green beans in spicy sauce, boiled egg with spicy sauce, fried potatoes, sweet and sour salad and fried bananas. They also had a vegetarian option, and an option which had more “adventurous” meat choices, like lamb. 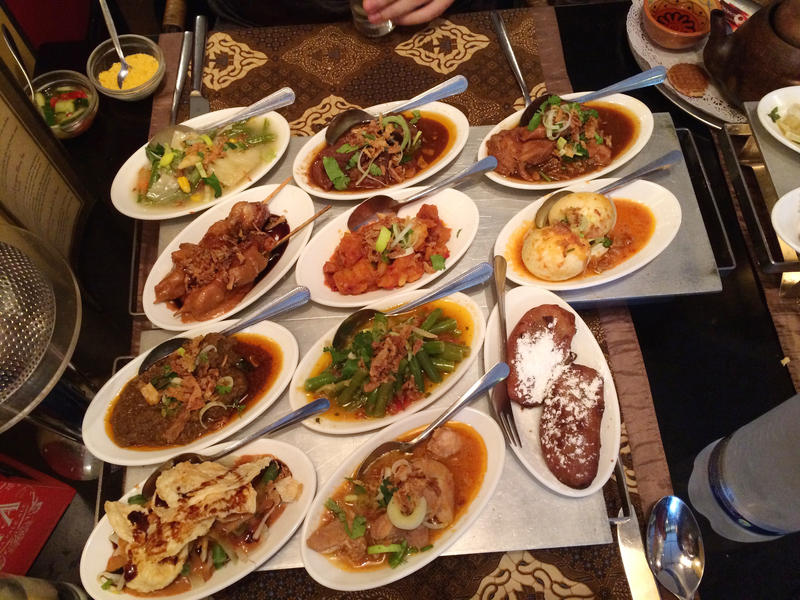 If you are ever in Amsterdam I HIGHLY recommend giving Indonesian food a try. It was such a fun experience. Well it looks like I’ve run out of pictures. In terms of other traditional Dutch food, one of my favorite things that we forgot to take pictures of was Poffertjes, which were like tiny little bit size pancakes with butter and powdered sugar. One of the traditional foods that I didn’t try was the herring. They say its good but I just couldn’t bring myself to eat a whole raw fish. Another thing we loved to do was walk through all of the different markets. There was always good, cheap, street food available wherever we went. 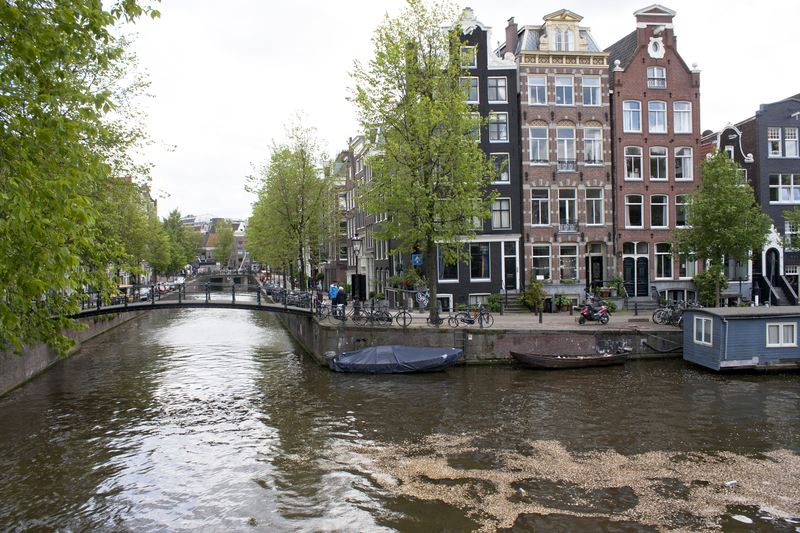 Overall, I thought Amsterdam was a beautiful city with amazing food and I definitely hope to go back sometime. Keep an eye out for posts about Stockholm and Copenhagen coming up soon.